As the stock market has moved from record high to record high, a small but vocal group of permabears has argued that the market's strength is unsustainable. Two claims they've frequently made are that 1) corporations have artificially boosted their stock prices and earnings per share by engaging in large-scale stock buybacks, and 2) central banks have created a stock bubble by suppressing interest rates. Last week, Lawrence Hamtil from Fortune Financial Advisors wrote an article called What You Probably Believe About the Bull Market Is Wrong. The article argues that the bears are wrong on both counts. They claim that the market's strength is illusory, but Mr. Hamtil thinks that the bears themselves are creating an illusion with misleading arguments. Since the stock market has risen so much and so consistently over the past eight years, ridiculing permabears is easy. But I think they're mostly right about both buybacks and central banks, and I want to defend my fellow pessimists from some of Mr. Hamtil's criticisms. It is certainly true that corporations have been borrowing heavily in recent years, using a good portion of the proceeds to buy back their shares. Again, however, this is completely normal corporate behavior. In the Anglo-Saxon corporate model, executives are employed by shareholders first and foremost to maximize shareholder value, and part of that is returning cash to them, generally in the form of dividends or buybacks. The proportion of corporate earnings distributed to shareholders through dividends and stock buybacks has risen steadily since 2010 and is now over 100% for the Standard & Poor's 500. But the aggregate figure doesn't tell the whole story: large technology companies like Apple and Google hoard cash, so there must be many other companies in the S&P 500 that distribute far more than 100% of earnings. If you are still not convinced, just look at the valuations of large companies such as Gilead Sciences or IBM, which have spent tens of billions on share repurchases, yet trade at well-below market multiples, while Tesla, a company notorious for large secondary equity offerings, trades at a significant premium. This comparison is unfair because the companies that buy back stock and the ones that don't generally have different circumstances. Companies that repurchase stock often do so because they have limited opportunities for growth and reinvestment, and are valued accordingly, whereas companies that have major growth plans need to invest in those plans and often can't afford to buy back stock. For example, sales of Gilead's biggest drug are declining, while Tesla is a hot growth stock in a capital-intensive industry. I believe that Gilead and its ilk would trade at even lower valuations if they didn't buy back stock. I say that because of my experience following Japan's stock market. Many small-capitalization Japanese companies have few growth prospects but earn decent profits, which they hoard rather than paying dividends or repurchasing shares. These companies tend to trade at low, or even negative, enterprise-value-to-earnings multiples because investors assume they will continue hoarding cash indefinitely and won't distribute it to shareholders. Value investors who would normally love to buy stocks at such low valuations are repelled by the companies' indifference to shareholders' interests. If they began paying large dividends, buying back stock, or making tender offers, in many cases their stocks would quickly triple. 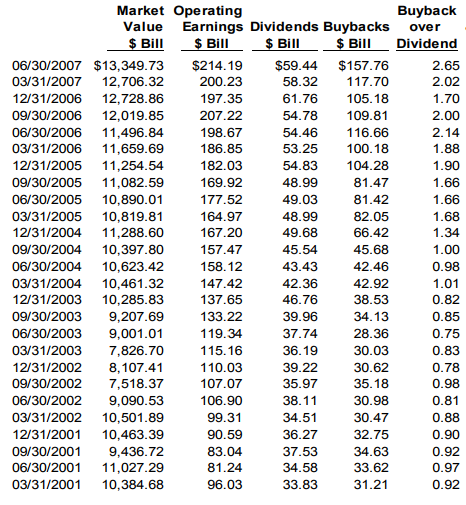 A final note on stock buybacks and valuation: buybacks are very pro-cyclical. Companies do them most aggressively near market peaks, when corporate profits, the ability to borrow, and stock valuations are all relatively high, and the demand from buybacks helps push stock prices and valuations even higher. 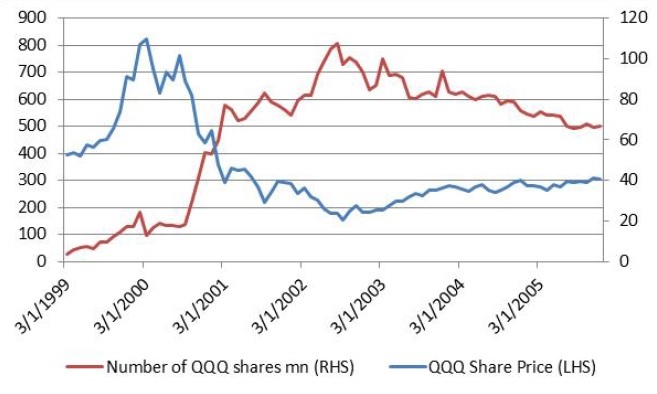 By contrast, corporations often suspend stock repurchases during recessions and crises, when stock prices are falling, thereby exacerbating the decline by removing demand. So I agree that buybacks aren't unique to today's market: they've amplified stock-price moves ever since they became widespread. Another myth that will not die is that quantitative easing ("QE"), and zero-percent interest rate policy ("ZIRP") have fueled the bull market since 2009. This is easily disproved. Fundamental factors such as robust profit margins and commensurate earnings growth have been the biggest contributors to equity gains, not easy money. The flaw in this reasoning is that ZIRP and earnings growth aren't discrete phenomena. Low interest rates make corporate borrowing cheaper, raising earnings and returns on equity for leveraged companies. Low interest rates can also benefit companies indirectly. In my opinion, Apple is a major beneficiary of low rates. Many people who own iPhones can't afford to buy them outright, so they effectively lease them through a contract with their wireless carrier. In a typical contract, the buyer pays more on a monthly basis than he otherwise would pay but gets to buy an iPhone at a drastically reduced price. ZIRP lowers the cost of this "lease" to little more than depreciation. To be fair, central banks aren't necessarily the only reason why interest rates have fallen. Demographic trends in many countries are deflationary and may contribute to low rates. Nonetheless, central banks have done a great deal to push interest rates lower, both through their control of the short end of the yield curve and through QE. Central banks also influence investor sentiment: many stock bulls believe in the existence of a central-bank put that supports asset prices. If easy money were the main driver of equity performance, then areas of the world with proportionately larger central bank stimulus programs, like Japan, would have fared much better than areas with less stimulus. It is worth noting that the Fed ended its quantitative easing program in October of 2014, and ended its "ZIRP" program in December of 2015, yet the U.S. has outperformed both Europe and Japan (in dollar terms) since, despite much looser monetary conditions in those regions. This presupposes that monetary stimulus stays in its country of origin, which isn't necessarily true. Macro traders have long joked about Mrs. Watanabe, the proverbial Japanese housewife who invests her family's savings in the carry trade because she can't earn attractive yields in Japan. And Mrs. Watanabe isn't alone. Russell Clark from Horseman Capital has written about Japanese retail investors buying American REIT funds with enhanced yields and bond funds that generate extra income by buying Turkish lire. I think that US stocks began to outperform their European and Japanese counterparts in late 2014 precisely because the Federal Reserve tightened monetary policy before other central banks. Continued unconventional monetary policy in Europe and Japan ensured that there would be many investors looking for yield; the U.S.'s comparative tightness made it an attractive destination for those investors. On Twitter, Jonathan Tepper writes that "Euro portfolio managers have told me they can't earn a living buying EU bonds after QE. Had to buy riskier or US bonds." All the while, equity exposure among American individuals is well below pre-crisis highs, having fallen from 62% to 54%. As Horseman Capital has shown, many Japanese individual investors do reach for yield. And individuals investors aren't the only force in the stock market. Hedge funds account for a disproportionate share of trading relative to their net assets. Corporate and governmental pensions are major stock investors, and many of them are under-funded, which pressures them to invest more aggressively and take greater risks. Many insurance companies are in a similar situation: they need to earn high returns to meet their future liabilities, so they too may feel compelled to invest more aggressively. Finally, I think there are two psychological reasons why individual investors aren't chasing the market higher. Another reason is that traumatic events can destroy investors' willingness to respond to incentives. A few years ago, I read a biography of Aristotle Onassis, the famous shipowner. Onassis entered the shipping industry at the end of the Great Depression and became a major player after World War II. His early success was a result of two things: 1) he was able to borrow money to buy oil tankers on very favorable terms, and 2) the major oil companies were capital-constrained, so they had to offer advantageous terms when they chartered tankers. Despite these propitious circumstances, few of Onassis' rival shipowners were willing to leverage up and buy more tankers. Why not? Because they were older than Onassis and had either gone broke during the Depression or nearly gone broke, and that experience had permanently scarred them. They knew that the post-WWII market was very favorable to tanker owners, but leverage had hurt them before, so they weren't willing to use it again. While the past few decades are nothing like the Great Depression, I believe that many individual investors have experienced a similar psychological trauma. The Japanese stock market peaked on the last day of 1989. It's dropped 50% in the 27 years since then, and at various times it was down more than 75%. American stocks have performed better than Japanese stocks, but they've still experienced gut-wrenching volatility. Since 2000, the S&P 500 has fallen 50% twice. And many individual investors have locked in those declines by buying near the top and then panicking and selling near the bottom. Any investor who's lost money over 27 years, or who's endured two 50% declines in order to earn a measly 4% annual return, will be tempted to swear off stocks for good. Central banks can give investors enormous incentives to touch the stove, but if they've already burned their fingers twice, even the best incentives won't convince them to touch it again.